A leading gun control group announced on Saturday that it is forming a new group aimed at high school and college students. Everytown for Gun Safety, a group funded in part by former New York mayor Michael Bloomberg, said it had created a new initiative called Students Demand Action in a Facebook post over the weekend. "NEW!" the post said. "High school and college students across the country are teaming up with Moms Demand Action and Everytown for Gun Safety to launch #StudentsDemandAction, an initiative that gives students the opportunity to lead the charge against gun violence." The post encouraged people to click through to the group's website where they are prompted to join Students Demand Action by providing their name, email address, zip code, and phone number. "Classrooms and college campuses are places for learning, not places to worry about gunfire," a message on the site said. "We are determined to fight for our lives, our dreams, and our communities. And we will not stop until all American students are allowed to feel safe in their classrooms." The new initiative comes in the wake of the shooting at Marjory Stoneman Douglas High School in Parkland, Fla., where 17 people were murdered. It's unclear at this time what events, if any, Students Demand Action will be involved in or what actions it will take. The group has yet to announce any events that Students Demand Action will be involved with. 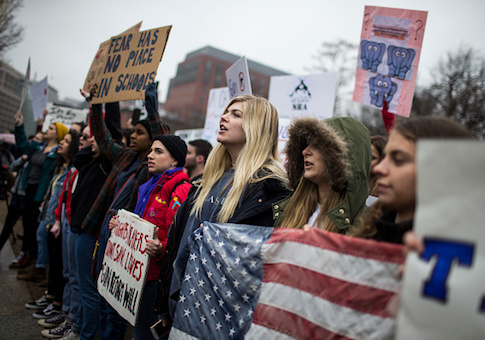 There are a number of upcoming gun control marches and protests involving high school students in a number of major American cities, but it's unclear if the group will be at any of them. Everytown for Gun Safety did not immediately return a request for comment. This entry was posted in Uncategorized and tagged Gun Control, Michael Bloomberg. Bookmark the permalink.